The “Makedonia Airport” in Thessaloniki is the second largest airport unit in Greece, serving over 5 million passengers per year and served by 27 international airlines on a regular basis, in addition to an extra 10 airlines that operate during the summer using charter flights. Thus it connects the city to many European capitals and several other European cities by direct flights. It also offers direct flights to other major cities of Greece and many Greek islands. Among the air-companies that fly to Thessaloniki’s airport are: Aegean Airlines, Austrian Airlines, British Airways, Lufthansa, Scandinavian Airlines, Turkish Airlines and many low-cost companies such as Ryanair, EasyJet and Wizz Air. The airport is located 16 km from the city center. A public bus service (no. 78 and no. 78N) connects the airport with the center of the city at 20-minute intervals throughout the day and takes you to the center in less than 30 minutes (ticket costs €2). The bus also stops outside the conference venue, Grand Hotel Palace (bus stop name: “Oryzomyloi”). A taxi service is also available at the airport on a 24-hour basis (a 20-minute drive that costs approximately around €25).  Makedonia airport to city center: €22 (appointment required, €5 penalty if the flight delays for more than 45 minutes and the company is not informed). Makedonia airport to Grand Hotel Palace: €24 (appointment required, €5 penalty if the flight delays for more than 45 minutes and the company is not informed). Grand Hotel Palace (or city center) to Makedonia Airport: €20 (telephone booking required). IAAE conference – bus service: Free transfer to Grand Hotel Palace from designated points in the city centre on Thursday June 25 at 8:00 and on Friday/Saturday June 26/27 at 8:30. Designated points are marked on the map that follows with red circles. 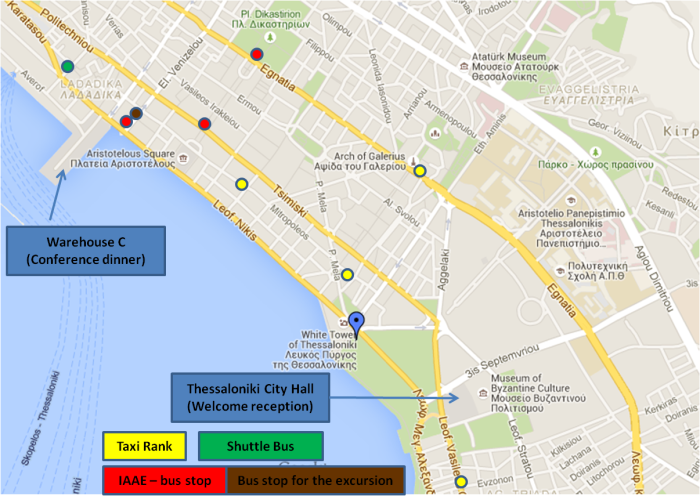 Public bus lines: No 8, 12 and 78 (airport line) stop in front of Grand Hotel Palace (bus stop “Oryzomyloi”). Single-journey tickets cost €1 (€1.10 if bought onboard from the ticket machines). GHP – MH: 8:00, 9:00, 10:00, … , 20:00, 21:00, 22:00. MH – GHP: 8:30, 9:30, 10:30, … , 20:30, 21:30, 22:30. * On June 24 the shuttle bus service starts at 14:00. There is no service between 17:00-18:00 on June 26, 27, and between 16:00-17:00 on June 28. Taxi: Radiotaxi Mercedes (email: info@radiotaximercedes.gr; Tel. +30 2310 556203) offers special rates for IAAE participants. All vehicles are air-conditioned. For participants staying in the city centre, buses will depart from Grand Hotel Palace at 17:45 and 18:30 and drop people in the city. The City Hall is walking distance from all hotels in the city centre. For participants staying at Grand Hotel Palace, buses will depart at 19:30 and drive directly to the City Hall. Buses will depart from the City Hall around 22:00 back to Grand Hotel (subject to changes). For participants staying in the city centre, buses will depart from Grand Hotel Palace at 17:45 and drop people in the city. Warehouse C is walking distance from all hotels in the city centre. For participants staying at Grand Hotel Palace, buses will depart at 19:30 and go directly to the venue. Buses will depart from the venue around 22:30 back to Grand Hotel (subject to changes). Bus service: Buses will depart from a designated point in the city centre on Sunday 8:15 and from Grand Hotel Palace at 8:30. The designated point is marked on the map that follows with brown circle. There are two means of public transport in Thessaloniki, buses and taxis. The city has a dense network of bus lines connecting all parts of the city and suburbs. All buses are air conditioned and many are suitable for handicapped people. The bus line that connects the airport to the domestic bus (KTEL) terminal is the express 78 line. Tickets cost €2 and are valid for one ride. They can be bought from the kiosks or from vending machines on board (no change is given at these machines). Within the city, bus tickets cost €1. There are also tickets available for two (three) trips, which are valid for up to 70 (90) minutes at the cost of €1.20 (€1.20); after their validation tickets do not need to be validated again in subsequent buses. Students and persons aged over 65 years pay half price, so long as they hold a valid id card. Information on routes, schedules, etc. are given at the webpage of OASTH. Taxis are available throughout the city, 24 hours a day. Along the main city streets taxis can be hailed only in designated places, easily identified by the “TAXI” sign. In all other streets, taxis will stop when hailed everywhere. During off-peak hours, taxis are stationed in “piazzas” waiting for customers; ask anyone for the closest piazza and get in the first taxi in line. Taxis are also readily available outside major hotels. Notice that credit card payments are not accepted. A taxi ride can also be ordered by calling one of the following taxi companies (add +302310 in front of the phone numbers): Thessaloniki-551525, Lefkos Pyrgos-214900, Makedonia-550000, Megas Alexandros-866866, Mercedes Club-525000 and Omega-511855. Surcharges might apply. Fares may vary depending on the distance and traffic. The fare is displayed on a visible spot, usually in front of the co-driver’s seat. A metro line is currently under construction. When finished, its length will be 9,6 km with 13 stops, while its extension towards Kalamaria and Stavroupoli will add another 10,8 km to the network and 10 extra stations. Thessaloniki’s renovated railway station was opened in 1960 in a historic area of the city’s west end. Frequent services connect Thessaloniki to the entire European railway network and to major Balkan and Greek cities (a modernized version of the Orient Express). The domestic Intercity line reaches Athens in less than 4.5 hours with more than five journeys per day. The Port of Thessaloniki has always been a defining factor in the commercial and cultural identity of the town, establishing the city as the principal port of the Balkans. With a long history that goes back to ancient times, the port of Thessaloniki is today a major harbor station for both commerce and passengers. For enquiries contact info@iaae2015.org © Copyright. IAAE 2015 Annual Conference. All Rights Reserved.